This page covers the author of Great Expectations. For other authors named Charles Dickens, see the disambiguation page. Charles Dickens has 1 media appearance. Remember those books that you were required to read in school? Required Reading Revisited is your chance to take a second (or first) look at some of those books. We meet the second Sunday of every month at 4pm. This month we’ll discuss A Tale of Two Cities by Charles Dickens. 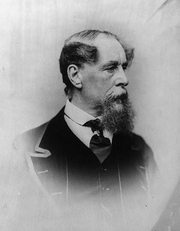 Charles John Huffam Dickens (7 February 1812 – 9 June 1870) was an English writer and social critic. He created some of the world's most well-known fictional characters and is generally regarded as the greatest novelist of the Victorian period. During his life, his works enjoyed unprecedented popularity, and by the twentieth century he was widely seen as a literary genius by critics and scholars. His novels and short stories continue to be widely popular. Charles Dickens's book Ghostly Tales was available from LibraryThing Early Reviewers. Charles Dickens's book The Holly-Tree Inn was available from LibraryThing Early Reviewers. Charles Dickens's book On Travel was available from LibraryThing Early Reviewers. Charles Dickens's book A Christmas Carol The Graphic Novel was available from LibraryThing Early Reviewers. Charles Dickens's book Great Expectations - The Graphic Novel was available from LibraryThing Early Reviewers. Charles Dickens's book A Christmas Carol was available from LibraryThing Member Giveaway. "Charles Dickens" is composed of at least 2 distinct authors, divided by their works. You can edit the division. Charles Dickens is composed of 6 names. You can examine and separate out names.